Reynolds feels an affinity with this road, and with North America in general. His grandfather lived in Swan River; Reynolds himself, who as a boy set plastic cowboys against plastic Indians, grew up to read Dee Brown’s Bury My Heart at Wounded Knee, and says he was roused “to anger, despair, tears”. He wants to separate myths from reality; to see where the Indians lived and died, and how the descendants of their survivors live now. His vehicle is a Toyota Prius, a “little red hybrid planet-saver”. His book, too, published in North America, is something of a hybrid, combining American spelling (gray, traveler, center) and evident enjoyment of the open road with the author’s countervailing impulse to act his age (61) and, more restraining, to act like an Englishman. What might he have heard if he had taken up his invitation to join a party in a bar that was open till 3am? What might have happened if he had got angry enough to confront the racist shopkeeper he met in Garden City, Kansas? Each time, English reserve and niceness (this is a man who goes to the rodeo and roots for the steers) got in the way. 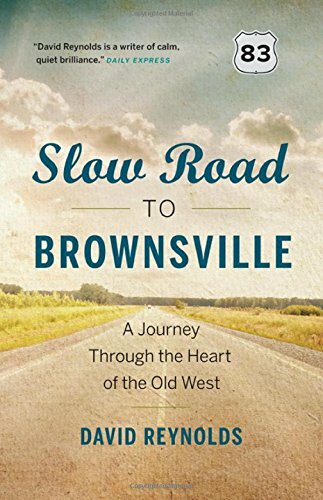 Slow Road to Brownsville by David Reynolds is published by Greystone Books at £10.99. This review first appeared in Telegraph Travel.